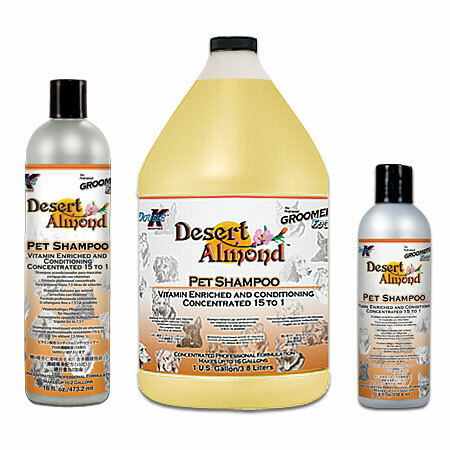 DESERT ALMOND™ professional shampoo is the perfect choice for thorough, gentle cleaning. Rinses easily and leaves hair soft and lustrous. Special deodorizers remove odors, leaving the coat with the fresh scent of almonds. DESERT ALMOND™ is specially pH balanced for pets and is fortified with Panthenol, Aloe, and Vitamins A, D, E. Great for dogs, cats, puppies, kittens, and all companion and farm animals.